You’re about to learn some useful shapes and shape adjectives. For even more English vocabulary, check out Maths Vocabulary in English: Do You Know the Basics?. OK. Take a look at this image. Can you describe it? 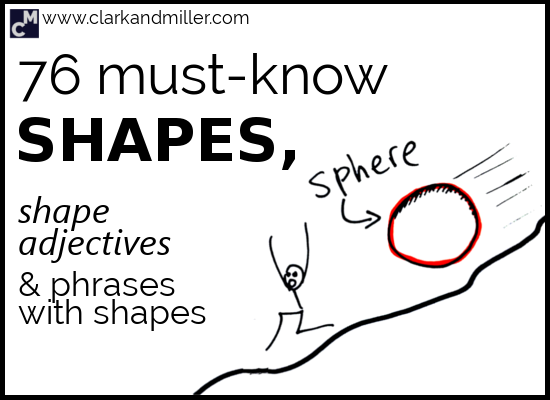 Describing simple shapes in English (especially when they’re 3D) isn’t as easy as it seems. Learn the most common 2D and 3D shapes in English. Learn some shape adjectives to describe objects more generally. Learn some common English idioms and phrases with shapes. Laugh at some silly pictures. We can talk about a square meal, meaning a proper meal that will kill your hunger and make you feel nice and happy and ready to take on the world. It may or may not include hummus. *No one knows this. I actually had to Google it. OK. This may not be the most useful shape in the world. But it’s kind of pretty, right? We use “circle” in lots of different phrases. A vicious circle — When something bad causes something else bad to happen, which then causes something else bad to happen. Forever. Think about people getting further and further into debt or when people argue, making each other angrier and angrier. Go around in circles — When you do something for a long time but achieve NOTHING! Like when you’re trying to change the settings on your phone so that it stops waking you up in the middle of the night telling you about the royal wedding. But you can’t find the “turn royal wedding off” button. So after an hour of trying to fix the problem, you just give up because you’ve been going around in circles for an hour. Inner circle — This is an exclusive or elite group at the centre of power. Maybe it’s something big, like a whole country (the president’s inner circle) or something smaller like a company (the manager’s inner circle). People in an inner circle are usually quite secretive. The US president’s office is called the Oval Office. I just had a look on Google and yes — it’s definitely shaped like an oval. Do you like cricket? No? Me neither. But one of the most famous cricket grounds in the UK is called The Oval. When we were kids, my Dad took my brother and me to watch a cricket match there. We were bored after an hour. Five hours later the cricket playing stopped, and we could finally leave. I asked my Dad who had won the match. Love triangle — Bob likes Yasmine, but Yasmine’s more interested in Jo. Jo doesn’t like anyone (except for his cat, Timi, who likes sleeping, mostly). Bob, Yasmine and Jo are trapped in a love triangle! The perfect set-up for soap operas. The Golden Triangle — This is the name of a part of Asia that covers where Thailand, Laos and Myanmar meet. Equilateral triangle — all the sides are the same length, and all the angles are the same. Isosceles triangle — two sides are the same length, and two of the angles are the same. Right-angled triangle — one of the angles is 90 degrees. We all know about the Pentagon, right? It seems US government institutions like naming things after shapes. In some institutions, like schools and universities, you might find the octagon, which is an octagonal space, perhaps with grass in it, perhaps not. You can also have an octagon theatre. It’s a theatre in the shape of an octagon. Obviously. We have ice cream cones. Probably because they’re shaped like a cone. We also use “cubic” to describe three-dimensional areas, e.g., cubic centimetres (cm3), cubic metres (m3), etc. But I can’t talk about pyramids without thinking about one of my favourite songs, Pyramid Song. Sphere of interest — Google defines this as “A country or area in which another country has power to affect developments though it has no formal authority.” I define it as “Places that powerful countries can use to make themselves more powerful.” Politics is fun! the situation gets completely out of control. I’d imagine this happens a lot at children’s birthday parties. Not that I’d know — I like to avoid large groups of children. So much chaos! A downward spiral — This is when a bad thing just gets worse and worse (similar to “vicious circle,” above). I always think about addiction when I think about this phrase. When someone gets addicted to drugs or gambling or cheese, it just gets worse and worse. They’re stuck in a downward spiral. Downward Spiral is also the name of one of the best albums ever created. Here’s a song you might recognize from it. Did you notice that the adjective form of many of these contains “-shaped”? In fact, “-shaped” is really useful. You can add it to anything! Symmetrical — the same on both sides, a mirror image of itself! Bulbous – sort of fat and round. I always just think of a nose. Flat – this is usually used to describe a surface. It means the surface is completely 2D. Round – like a circle or a sphere! Forked – When one line becomes two! Snakes have forked tongues. You can also have a fork in the road. Pointy – with a sharp end, like a sword. Thick – when opposite sides are far apart. Thin – when opposite sides are near. There you go: all the shape adjectives you could possibly want (probably). Describe the picture and leave your answer in the comments. I’ll let you know how you did! Did you find this useful? Do you know any people (or chameleons) that might also benefit from this? Then BE AWESOME AND SHARE! Spread the knowledge! A triangular pyramid, on top of a cube with a bulbous sphere out the side of it, the front has 2 square sides in front of it and over the pyramid. (that made my brain exercise). That was perfect! Nice one! I never thought anyone would bother. It’s surprisingly interesting to read. Thanks! a triangular pyramid is standing over a cube which at the one side of cube are two thin parallel rectangular wall which are parallel with cube side and at to side of cube is a cylindrical hole which a bulbous vase shaped object is passing through it. Wow! That was an EXCELLENT attempt! 3. Try breaking it down into fewer, shorter sentences. It gives the reader space to breathe!